When you live in Michigan, it’s easy to see what a unique and beautiful state in which we live, but did you ever ask yourself, ”Well, how did we get here?” or “What was here like BEFORE we got here?” or “Was the Mackinaw Bridge always there?” Michigan’s history is an incredible journey, one that includes extraordinary glacial activity that formed the Great Lakes, Paleo-Indian migration, Native American culture, European immigration, the Industrial Age and so much more! Wolverine Will has seen it all! 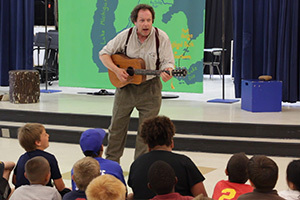 Born in what is now called the Upper Peninsula of Michigan and a 19th-century lumberjack by trade, Wolverine Will has learned how to use his time machine, or imagination, to travel to any point in Michigan history that he chooses. 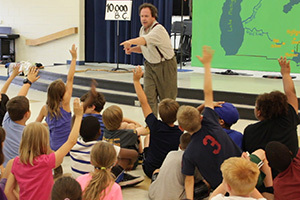 He teaches children how to fine-tune their own time machines by using their senses of sight, hearing, touch and smell to imagine new environments and travel with him as he visits some of the most influential and incredible moments in Michigan history. Wolverine Will will take you on a journey that starts 12,000 years ago with the area’s first human inhabitants, the Paleo-Indians. Then, in the blink of an eye, he’ll travel to the 1600’s and visit Michigan’s Native Americans and European immigrants. Grab yer fightin’ sticks and join Will in the Michigan/Ohio war of 1835 and learn more about Michigan’s journey into statehood. Visit his lumberjack camp and learn how the forest industry dominated the state in the late 1800’s. 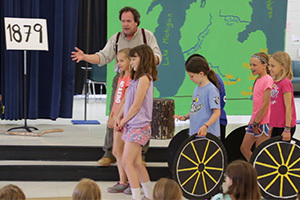 Finally, Wolverine Will drives you into Dearborn to visit Henry Ford and find out what his Quadricycle ever led to, while reminding students that they can become a part of Michigan history too by using the same tools Henry Ford used: innovation, hard work, and inspiration. From lumberjacks to lugnuts, Wolverine Will takes you on a whirlwind tour of Michigan history. Developed by a 1st-grade teacher, a theatre educator, and a professional theatre director, this show is specifically geared to augment your curriculum. It’s pure Michigan, y’betcha! "Engaging and educational both. After having Wolverine Will here once, I know I will want him to return..."
Get a hold of your state's representative directly with an email, or just give us a call at 800-433-7459. We're here from 8:00 am - 6:30 pm EST to handle all of your questions and scheduling needs. Time travel through Michigan's history! Number of Sessions 1-4 sessions per day. Additional sessions available for an additional fee. Custodial or adult assistance for load in and load out.